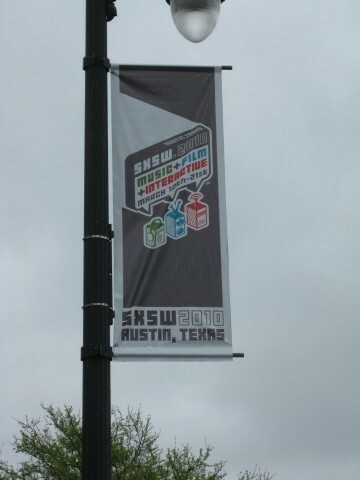 It's hard to believe that it took me nearly 10 years as an Austin resident to actually start attending South by Southwest. For the longest time I thought you had to have a wristband or a badge to see the "good" music. How wrong I was! In the last 7 days I've seen over 40 bands and spent a grand total of $8 in cover charges. My nephew, his girlfriend and our sister-in-law arrive from Chicago and after a sampling of Austin's finest trailer food we head off to Stubb's for the Diggnation party hosted by the Big Digg and a performance by the Walkmen. This is part of SXSW Interactive so we expect a few computer nerds there but no one could have been prepared for what we encountered. You see this Diggnation appears to be some kind of Internet show where these two knucleheads are on camera drinking beer, dropping f bombs and just rambling. And they actually have a following???? They spent an hour on stage doing their so called humor with the highlight being a visit from Austin film producer Richard Rodriguez. The strangest part was once they were done most of the crowd left - good for us since we moved to a spot 20 feet from the stage for the Walkmen. I had bought a CD of theirs a few years ago but could never really get their music. Well now that I've seen them live I can validate that feeling - I still don't get their music. They were proclaimed the best indie band in America by the Digg guys but I don't think I've ever been that drunk! Couldn't really understand what they were singing about and day 1 of SXSW ends! We try to flush the memory of Saturday night with a trip to the Salt Lick for the Bobby Flay proclaimed "best thing I ever ate" and man that is some good BBQ! Late afternoon we are headed to the U S Art Authority for a show benefitting the Capitol Area Food Bank. My goal is to see Suzanna Choffel - one of the next hot things in Austin according to the critics. We get there just as her set is beginning and catch most of it. She is cute and has good stage presence but I can't really tell you what she was singing about - not sure if it is her vocals or a bad mix. Not anything to rave about but we may have to give her another listen in a different environment. Later on the bill outside was Shurman who I've been turned on to by my internet music friend Shug from tiftmerritt.net. They play a good version of rock and roll - only issue to me was that most of the songs sounded the same. Maybe the 50 year old drunks by us took away from the set but definitely worth checking out again. Day 2 is complete. No music today or tonight as we are going to see "Lemmy" - the world premiere documentary about Motorhead's bassist. After getting over the fear of being the only person in line not wearing black and actually wearing a shirt with a collar we get in to the Paramount. Truly one of Austin's treasures it's such an awesome theater. The crowd is ready to roll and then Lemmy and the entire band enter the theater to a roar- not your normal movie crowd! The movie is entertaining - we find out he is a WWII collector and loves to play video trivia. But at some point it starts to drag and when we hit the two hour mark it's long. The show finally ends and although entertaining it's too long. We planned to go to the Mohawk to catch Black Joe Lewis and the Honeybears at the ATXEmerge party as my nephew has become a big fan from the Ipod in the last 2 days but when we leave the theater it's raining - and soon pouring. So we grab some food on the way home and save our energy for the days to come. Up next - Tuesday and then the madness really kicks in on Wednesday! Thursday at SXSW -They know Bruce in Iceland?? ?